I debated whether or not to post this, but in the end I decided it was just too darn good not to share with you. I don't know how many of you are like me, but I absolutely love watching The Food Network. One of my favorite shows to watch is Diners, Drive-Ins and Dives. The food always looks so amazing, and by the end of each episode I've usually seen five or six things that I'm just dying to re-create in my kitchen. This sandwich is one of those things. I saw a version of it on Triple D, and I just couldn't wait to make it. 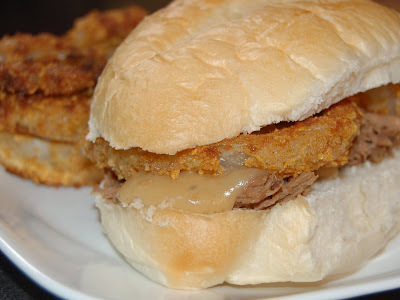 Roast beef, gravy, and onion rings, all piled on soft fresh bread? How could you possibly go wrong? This is a great sandwich. The meat was really tender, and the gravy thickened for me perfectly (and gravy is something that's always a little iffy with me; I'm an over-thickening repeat offender). I loved the crunch of the onion rings on the sandwich; they provided just the right amount of texture. I served some onion rings on the side, too, because I just can't seem to get enough of them. This sandwich is comfort on a roll, pure and simple. Thanks for the inspiration, Triple D! 1. Rub roast with salt, pepper, and garlic powder. Place in a Crock pot. Add bay leaf, thyme, and water. Cover and cook on low heat 9 to 10 hours or until meat is tender and shreds easily with a fork. 2. Heat butter over medium heat in a large saucepan. Add flour and whisk until mixture is thick and bubbly, about 1 minute. Add 1 to 1 1/2 cups of the beef cooking liquid. Stir over medium heat until gravy reaches desired thickness; salt and pepper to taste. 3. Top the bottom of a roll with a portion of the shredded beef. Top with gravy and two onion rings, then roll tops. Serve with additional onion rings on the side. What a fantastic looking sandwich!! You choose such good food all the time. I LOVED watching the Foodnetwork back home and I cant tell you how much I hate not having it here..diner food is the best and this is something Im bookmarking for sure!